WRENTHAM, Mass. – If you could draw up a prototypical King Philip football game, the Warriors’ 21-0 win over Foxboro on Friday night probably wouldn’t be too far off. 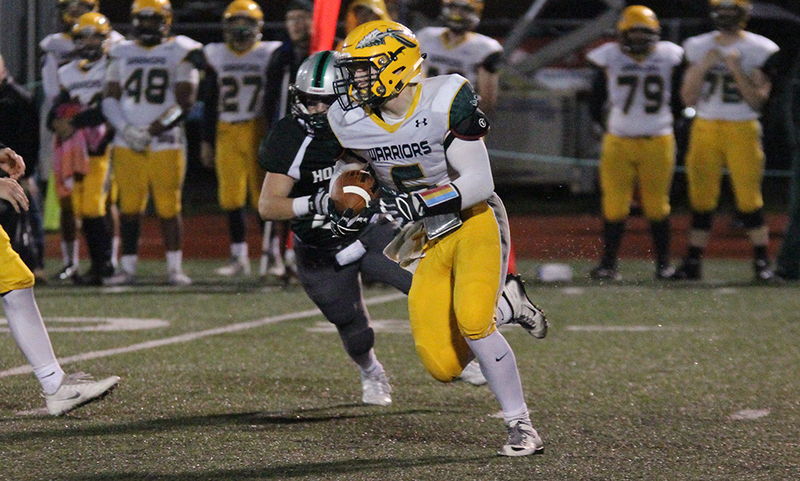 King Philip had its running game going, amassing all 236 of their offensive yards on the ground. The defense was stout, holding Foxboro to under 50 yards of total offense and forcing a turnover. And KP dominated on time of possession, picking up 17 first downs compared to just three for Foxboro. Senior back Sean Garrity (17 carries, 102 yards) went over the century mark for the second straight week while Shane Frommer (14 carries, 66 yards) and fullback Alex Olsen (seven carries, 46 yards) proved to be viable options as well. Both teams advanced inside the opposition’s 30-yard line on the opening drives but both sides failed to convert on fourth down. Mark Clagg’s pass to Jamaine Few in the end zone went incomplete to end Foxboro’s drive while Trey Guerrini broke up Brendan Lydon’s pass on fourth on KP’s opening possession. Foxboro’s second possession resulted in a punt and the end of the first quarter. King Philip worked the first drive of the second quarter inside the red zone but their 27-yard field goal attempt was short. The first turn of events finally came on Foxboro’s next possession when Dylan Leonard jumped the route, picking off Clagg on 3rd and 8 from the Foxboro 22 yard line. Leonard was able to get some yards on the return, setting up KP in the red zone. After Lydon converted a 4th and 1 and the nine with a sneak, Frommer and Garrity took back to back carries to get it to the two yard line. Lydon took it in himself with the sneak and freshman Cole Baker’s extra point gave KP a 7-0 lead just 41 seconds before halftime. KP started the second half in similar style, keeping the ball on the ground to move up the field. After Garrity was stopped in the back field for his first loss of the day, he took his next carry 33 yards up the left sideline, nearly breaking free for the end zone. Frommer romped through the defense for 15 yards on a pair of carries and Garrity took 15 more. Frommer was tripped up just outside the goal line, leading to Lydon’s second touchdown, this one a 1 yard sneak. Baker’s extra point gave King Philip a 14-0 lead with 4:58 left in the third quarter. “We were on the field way too much defensively tonight,” Foxboro head coach Jack Martinelli said. “You can only make so many stops and we didn’t punch back. You have to give them credit, they’re a good football team, they play hard, they play tough both ways. The score reflects the game was played. Foxboro was forced into punts on its next two drives, the latter coming from deep inside its own territory. Guerrini skied a nice punt that reached midfield but KP’s Andrew Dittrich found some space on the right side and raced for a 42 yard return, giving KP possession inside the 10. After a pair of runs from Olsen, Lydon grabbed his third touchdown with yet another 1 yard sneak. Baker’s extra point made it 21-0 with 8:36 left in the game. Nathan Gudas, Evan Rice and Sam Saintilus came up with sacks on Foxboro’s last possession, putting an end to the game. King Philip had five sacks with Garrity, John DeLuca, and Nick Kerr also getting in on the action. King Philip football moves to 2-0 with wins over two Davenport division teams, which do not count to the league record. It marks just the fourth time in history KP has beat Foxboro and North in the same season, including 2011, 2009 and 1969. The Warriors will start their Kelley-Rex schedule with a trip to Oliver Ames next week. Foxboro (1-1) will open up Davenport play on Saturday when they take a visit to Sharon to play the Eagles, who are sitting at 2-0. NORTH ATTLEBORO, Mass. – King Philip head coach Brian Lee likes to keep things close to the vest. 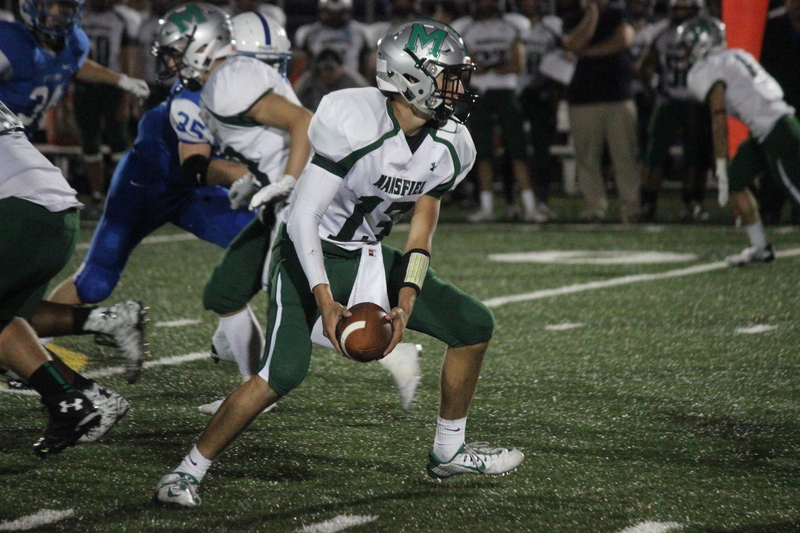 Coming into the season, many outside of the program expected senior John DeLuca to be the starting quarterback for the third straight year. Instead, on opening night at Community Field, DeLuca was split out as a slot receiver and junior Brendan Lydon was under center. Facing North Attleboro on the road is not the easiest task for a quarterback’s first varsity game, but Lydon answered the call with 112 yards, the game-winning touchdown, and most importantly no turnovers. 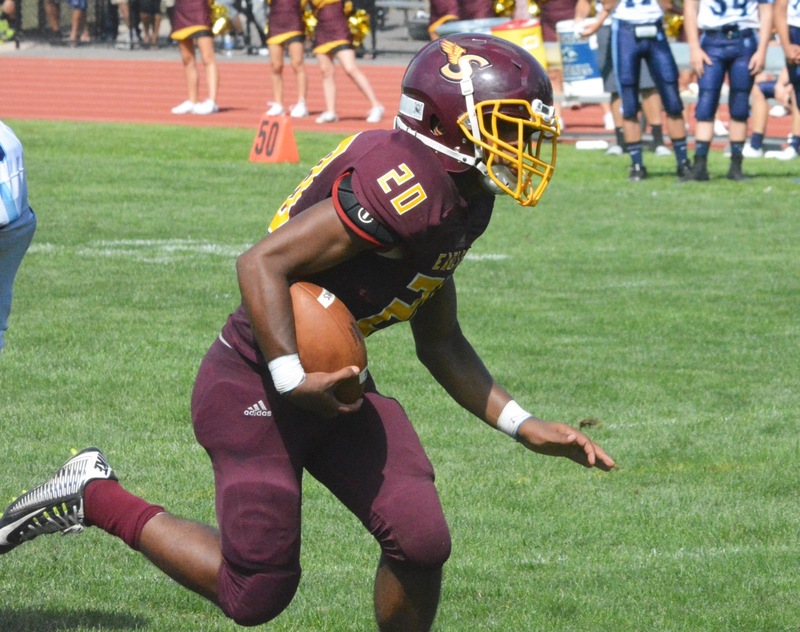 Thanks to a strong performance from Lydon, two touchdowns from senior running back Sean Garrity, and a typically smothering defensive performance, KP started its season with a 19-7 victory. The Warriors moved the ball well on its first drive, including a 26-yard completion by Lydon to Shane Frommer on a screen to the North 20-yard line. But, the drive stalled, as did KP’s second drive, which also ended up in Rocketeers territory until Garrity lost a fumble at the North 39. After back-to-back three and outs, North finally got something going offensively and moved the ball upfield. Junior Chad Peterson hit senior Bobby Mylod for 21 yards on third and 11 to keep the drive alive and then hit Mylod again on a crossing pattern for a 15-yard touchdown to give the hosts the lead. Another KP drive ended in North territory, but the Warriors got the ball back at the Rocketeers 26 when Frommer dove on Nick Rajotte’s fumble. It was doubly difficult for North, which also lost Rajotte to an injury for the remainder of the game. Garrity made the turnover count when he took a toss to the near sideline and burst through a hole for a 26-yard score that tied the game heading into halftime. The Warriors started the second half with the ball and quickly went back to work grinding out yards with the running game. Alex Olsen had a 10-yard carry on an inside handoff to convert on third and short and two plays later KP took the lead. North got pressure on Lydon, but he somehow eluded the rush long enough to fire a strike downfield to Michael Mello. The 48-yard touchdown put KP ahead 13-7. King Philip put the game away with a drive to make Lee proud. The Warriors moved 75 yards on 15 plays and ran out the remainder of the clock in the third quarter and the first three minutes of the fourth. Lydon found tight end Brett Mazur for a third down conversion, DeLuca (10 carries, 69 yards) ran the “Wildcat” three times for 25 yards, and Garrity finished the drive with a 12-yard rush up the middle. The Warriors were also dominating on defense. KP allowed only five first downs in the game and sacked Peterson four times. Junior Evan Rice, whose father played with Lee at Walpole High, had three of those sacks and two other hits that forced incomplete passes. Peterson (9-16, 59 yards) hooked up with Kyle McCarthy several times in the second half, but could not get the ball down field. Andrew Dittrich picked off a deep throw with a minute left to seal the win. North Attleboro will travel to Bishop Feehan next week, while King Philip will get another cross-division test when it hosts Foxboro. Foxboro went with a two quarterback system in 2015 with Clagg splitting snaps with senior Darren Kelly. This season, Clagg, who led the team with nine touchdown passes last year, has the starting position to himself. He is a mobile quarterback who can make throws on the run and has the arm strength to stretch the field with the deep ball. Clagg can also take off and get yards with his feet, so defenses have to keep an eye on the backfield to ensure he does not have a running lane. While the top three receivers from 2015 have graduated, but Clagg will still have plenty of targets to look for including Jamaine Few and he is experienced after helping Foxboro claim a share of the Davenport title last season. Sharon utilized several running backs last season, but few were as effective as Elisma. He could be dropped for a loss on one play but then break the next one for a long touchdown. On his day, Elisma was able to dominate a game with his speed to the edge and his strength to break tackles and extend runs in the secondary. Even though teams would regularly load up on the line of scrimmage daring the Eagles to throw, Elisma was able to find holes and turn small openings into big plays. This year, Elisma will be the primary back for Sharon and should get the bulk of the carries. If he can handle the workload, this could mean big numbers for the senior and, the Eagles hope, more success for the Sharon offense. Although he was limited to just one touchdown reception as a sophomore, Ferreira is one of the first players that opposing coaches mention when talking about the Hornets potential this season. The 6-foot-2, 200-pound receiver showcased his athleticism last year with catches in traffic or leaping above defenders. His size makes him a tough matchup on the outside and his speed makes it difficult for linebackers to stay with him, which caused teams to have multiple players assigned to keep an eye on him and opened up lanes for his teammates. 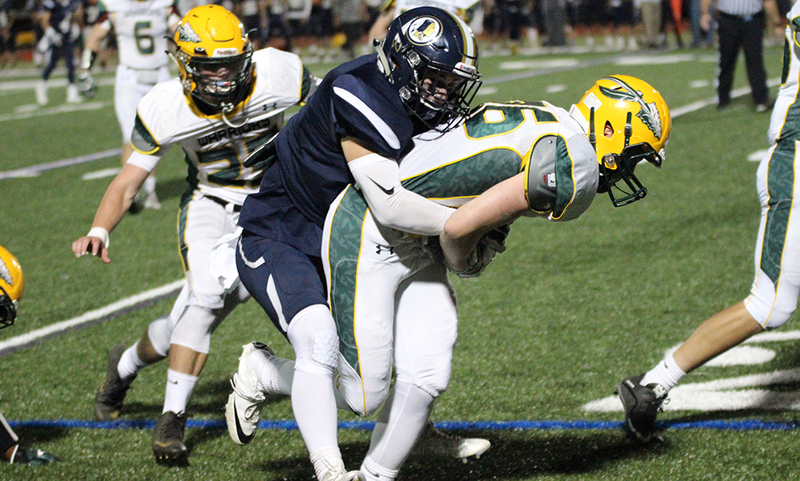 Ferreira made 32 catches for 631 yards last season and those numbers should go up this year as his relationship with senior quarterback Anthony DiGirolamo develops. As a sophomore, Furtado stepped in as quarterback midway through the season and provided a spark for the Attleboro offense, leading the Bombardiers to a win over King Philip in his debut and a Thanksgiving Day win over North Attleboro. His athleticism changed the way that defenses lined up against Attleboro and this year he could be used in a variety of ways to help the Attleboro offense. Furtado could be a change of pace quarterback alongside senior Tyler McGovern, a running back in a wildcat set, or even split out as a receiver when needed. His versatility (and the mystery about how he will be used) will be a major weapon for the Bombardiers and he was voted a team captain as a junior, which shows that he earned the respect of his teammates by his performance last season. Last season, Garrity rushed for five touchdowns, emerging as the go-to tailback for the Warriors. Heading into this season, Garrity has solidified his starting position in combination with classmate Giovanni Fernandez and there are high expectations that he can take his game to the next level. Garrity has the ability to get to the edge, changing the point of attack for the run-first KP offense, and can break big plays, such as his 75-yard TD last season. The Warriors will be hoping that his development can help shorten a few drives for the offense and help put more points on the board. Taunton has a new coaching staff that likes the spread formation and to throw the ball and McLaughlin has the potential to make head coach Brad Sidwell’s offense click this season as a big target for whoever gets the starting nod for the Tigers. At 6’3, McLaughlin is a big target and is difficult for defenders to deal with in one on one situations. He has the ability to take off on a fly route, use his speed and then size to beat defenders or can go over the middle or on a slant. He showed his ability to haul in tough passes last season as a junior. As Taunton’s offense develops more weapons, McLaughlin will become that much more difficult to handle. 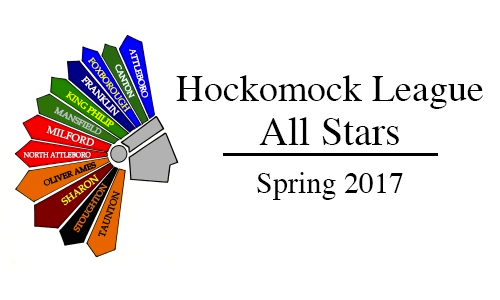 In 2015, Peterson beat out two teammates to earn the starting spot for the Rocketeers and it turned out to be a good decision by the North coaches. Peterson set a program record for completions in a season and led the Kelley-Rex division with 13 touchdown passes, as North won its first league title since 2011 and advanced to the Div. 3 Southwest final. While he has a big arm and can throw an accurate deep ball, Peterson also has the touch to make the throw over the middle. Despite his youth, he grasped the North offense right away and showed an ability to read defenses and make adjustments that was unusual for an underclassman. Thanks to Peterson’s performance last year, there is no quarterback battle in camp this fall and the junior is poised to take his game to the next level in North’s first year in the Davenport. North Attleboro’s offense possesses a lot of weapons and can hurt defenses in many different ways. Nick Rajotte is one of those weapons. In a crowded backfield last season, one that included the Kelley-Rex MVP Nick Morrison, Rajotte was second on the team with three rushing touchdowns. While also a talented defensive back, Rajotte’s speed is something that helps him on both sides of the ball. Rajotte and Bobby Mylod form a balanced 1-2 punch of speed and power. When Rajotte is able to get a little bit of space and get into the open field, not too many people in the area are going to be able to catch him. In North Attleboro’s offense with the Jet Sweep, Rajotte is able to use his speed to get around the edge and get up field. The Stoughton offense has always been predicated on a strong ground game and Sullivan will be a key to its success this season. As a junior he led the team with eight touchdowns and his quickness and breakaway speed make him a constant threat. Sullivan can make defenders miss with quick feet but he is also a downhill runner who is not afraid of contact. He will find the hole and turn up field right away to drive into the secondary. He has also been a constant threat as a receiver out of the backfield, outrunning linebackers and safeties on wheel routes. 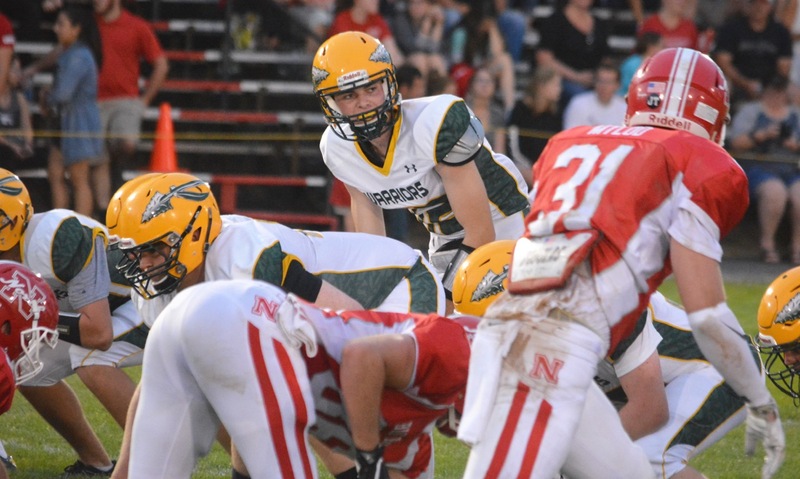 With a new quarterback this year, expect Sullivan’s role in the offense to expand. Franklin’s offense struggled to score points a season ago but Jake Wolowacki made the most of his opportunities when he was out there. The shifty back is hard to tackle on the first attempt and has shown the ability to break through contact. He can get around the edge on the outside and use his speed to get up field. He has a good first step that freezes defenders and allows him to find space and use his speed to get through the gaps up the middle. Last season, Wolowacki showed up his versatility by throwing for a pair of touchdowns as well so defenses will have to respect that. He can also catch passes out in the flats and get up field in a hurry.